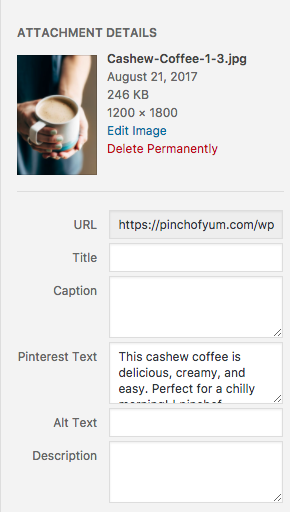 The Hidden Pinterest Image feature of the Tasty Pins plugin allows you to set a Pinterest-specific image that shows only when a reader uses a Save button to select an image from your site to save to Pinterest. Scroll to the bottom of the post edit window and find the meta box titled "Tasty Pins"
3. Click the button to select an image, then add some Pinterest Text over on the right. 4. Click the Select button on the bottom right and save your post. Tasty Pins allows you to add multiple hidden images to the page, too! Just click the "Select Images" button, then hold down the Command key (CTRL key on Windows) as you click all the images you want to add - same as selecting multiple images with the WordPress media inserter. 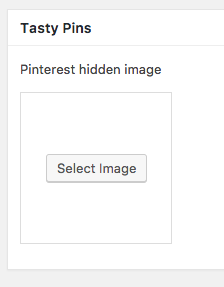 Make sure each image has an optimized Pinterest description, then click "Select" to add all the hidden images to your post.